Calpe - Something for everyone!! Dominated by the imposing image of the Rock of Ifach, Calpe sits on the shores of the Mediterranean with its golden sandy beaches, surrounded by a beautiful landscape filled with mountains and vineyards. Many ancient civilisations settled in this town in the Marina Alta region of Alicante, a history narrated by the remains it preserves, which include the Roman baths "Baños de la Reina" (Queen's Baths). Deeply-rooted traditions harmoniously coexist with the tourist industry, making it one of the main destinations on the Costa Blanca. Eleven kilometers of sandy beaches and coves, a marina and a beautiful natural environment are part of the immense appeal of the town. Including, of course, it’s astounding gastronomy, an authentic showcase of Alicante's cuisine. Calpe, a town with a long history and deeply-rooted traditions. The Marina, the promenades and wonderful coastline, marked by cliffs, sandy beaches, idyllic seas and intriguing coves, are some of the many attractions. Another attraction is one of the symbols of the town, the Rock of Ifach, a huge calcareous rock, 332 metres high, that penetrates the sea and gave the town its name. This region has been declared a Nature Reserve, because of its botanical and faunal diversity. The best views of Calpe and its coastline are seen from the top of the rock, accessible through guided tours from the park. The mild climate and the peculiar orography of the area make this town the ideal destination for everyone, from those seeking beaches and sun to fans of outdoor sports. Refreshment kiosks and equipment-hiring stands that offer windsurfing boards and jet-skis are located all along the beaches of La Fossa and Arenal, which have a beautiful promenade and offer all kinds of services. Among the many quiet coves in the bay is Les Bassetes, famous for its beautiful seabed and crystal waters. This cove rivals others such as La Manzanera and Les Urques in beauty, perfect for sailing and scuba diving. Calpe also has a sailing school for both beginners and advanced students and a scuba-diving centre in Puerto Blanco. Lovers of outdoor sports can climb the Rock of Ifach or go potholing in the Barranc del Mascarat and the Oltá Mountain. Calpe was inhabited by many different Mediterranean cultures. Iberians, Phoenicians and Romans all found a surveillance privileged point in this land, thanks to the Peñón de Ifach. The present town of Calpe was established in the area surrounding the Rock. Its history is narrated by the remains it preserves, including the Baños de la Reina (Queen's Baths), from Roman times. The historic quarter of Calpe is bordered by the old walls, erected in the 15th century to defend the city against pirate attacks. Next to the Moorish quarter of El Arrabal, part of the medieval walled precinct is preserved, some fronts and the large Tower of Peça. Nearby, the parish church devoted to the Virgin of the Snow, dating back to the 15th century, is the only Gothic-Mudejar temple in the Region of Valencia. Two beautiful examples of religious architecture are also found in Calpe: the hermitages of La Cometa and San Salvador, both from the 17th century. The rural tradition of this town is present in its outskirts. Hillsides covered with vineyards alternate with beautiful examples of local architecture, like Casa Nova, a typical farm with the appearance of a fortress and Pou Salat, the old water supply. Calpe's traditional gastronomy is mainly based on rice and fish. In addition to the famous paella, there are other rice dishes with beans and turnip, which are baked or served with Swiss chard. Also typical are dishes like the octopus casserole and Llauna de Calpe (fish stew). The wines with the label Designation of Origin - Alicante should accompany any of these delicacies. As is common in the remaining towns of Alicante, Calpe also has cultural calendar filled with fiestas and leisure activities. From Carnival to Fallas de San José (March 19)and including the Bonfires of San Juan (June 24) and the festival of Moors and Christians (October). The local holidays, devoted to the Virgen de las Nieves (Virgin of the Snow), takes place on August 5. From Calpe, many different excursions can be taken to other towns on the Costa Blanca. Denia and Jávea are located north of Cabo de la Nao (Nao Cape). These are tourist towns with an extensive coastline of beaches and coves. The visit may continue to the Montgó Nature Reserve, where the outline of the mountains dives down into the Mediterranean, creating spectacular cliffs. To the south is the town of Teulada, famous for its muscatel vineyards and Moraira, the jewel of the Costa Blanca! Altea is dominated by the blue dome of the church of Virgen del Consuelo. L’Alfàs del Pi is an inland town that meets the sea on the beach of Albir. Benidorm, with its excellent beaches, makes this region one of the most important tourist destinations in Alicante. Alternatively, for a great day out visit Paramount Theme Park, Aqualandia, Mondumar, Font D'Algar, Verger Safari Park or even Valencia for it shopping and culture. Very well furnished and presented villa with lovely open views. A short drive from the town of Calpe with a vast array of restaurants, bars, shops, supermarkets and its famous long golden sandy beaches. 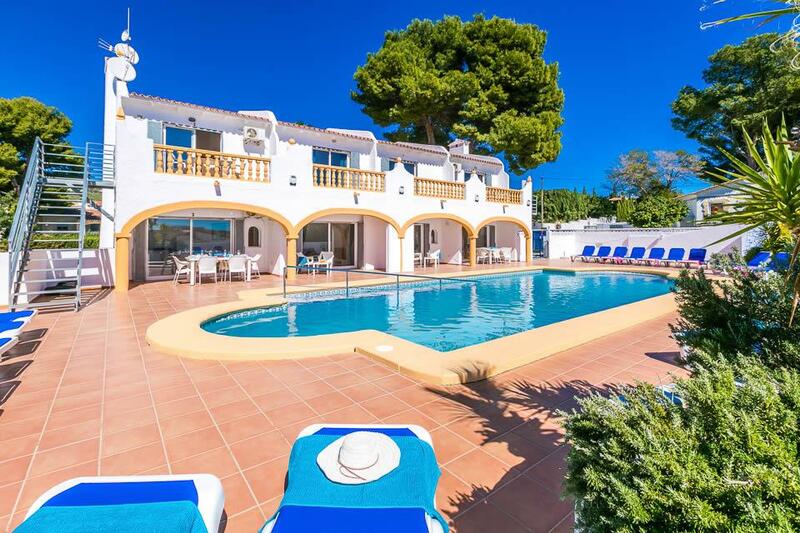 Benefits from wifi internet, UK freesat channels..
A huge, well appointed villa with super-size private pool that is perfect for very large groups wanting to holiday together. Very well presented throughout, Villa Tianna is only available as one complete villa, sleeping up to 28 guests in comfort, made..